_ _ Every year at the end of July, my hometown of Ithaca, New York comes alive… The aging hippies put down their bongos, pull on their Birkenstocks, and pile en masse into rusty Volvos to make the drive out to Grassroots, a music festival featuring both famous and local (but mostly local) artists. As a teenager, I used to drive out and hop the fence because tickets were too expensive for me to afford on my dishwasher’s salary, but as the years passed, security got tighter and I was politely escorted from the premises more often than I got to stay… Damn the man! Grassroots, and, by the transitive property, summers are now inextricably linked, in my mind, with zydeco music, dancing shamelessly, muddy feet, and the constant concern that so many people could not know how truly awful they smell… oh, and fried dough. It used to be that I only could get fried dough at places like Grassroots or state fairs, but I realized the other day, to the detriment of my waist line, just how easy it is to make at home. 1. Heat the oil in a pot on medium heat for several minutes… I don’t have a thermometer, so I didn’t use one. It’s not an exact science, but when a drop of water on the oil sizzles, or if you put the end of the hand of a wooden spoon on the bottom of the pan and bubbles come up the sides, the oil is ready for frying. 2. While the oil heats, open the can of crescent rolls and separate the rectangles, pinching together any seams (there should be a total of 4 rectangles). You can cut the rectangles in half and do single layers, but I like to fold them over and press together the edges for a thicker dough. 3. Drop one piece of dough into the pot. It will likely sink at first, but it should quickly rise to the top. When one side has browned to a dark golden color, flip the dough over with a pair of tongs and let the other side brown as well. Remove from the pot and allow the dough to sit briefly on a paper towel to get rid of the extra grease. Repeat with the remaining pieces of dough. 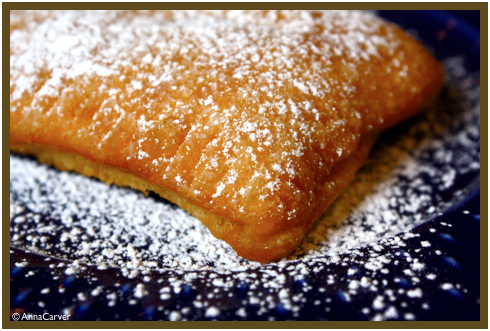 Dust them all with powdered sugar or cinnamon sugar while they’re still hot and serve! Having just got back from the “Big Easy” having eaten my fair share of beignets at Cafe Du Monde, I can heartily agree. Fried dough is a good friend.